The above image is only one example of metal petrified into stone. 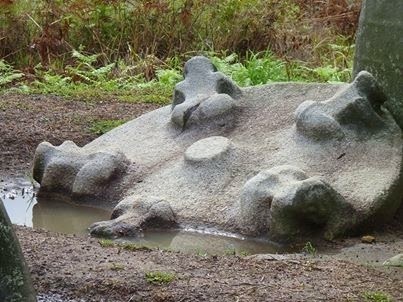 It was once part of archaic megalithic metal machinery and found in Gornaya Shoria, Siberia (Russia), legendary land of archaic giants. Gargantuan megalithic stone walls are nearby. What are gold, silver, copper, and all the other uncountable metal deposits? Normally when we find metals they are in stone - as ore. The ores too, could once have been refined metal objects, but have again petrified into stone - by melting, flattening and rusting from moisture and heat of compression by water and sedementary layers above them, some becoming ore veins. All stones, metals and minerals were once sand, silt, clay, ores, lava, etc. Some physical objects have been compressed and hardened/petrified into stone as layered earth sediments under oceans and seas, and have since been pushed up into broken, layered and folded mountains all over the earth. 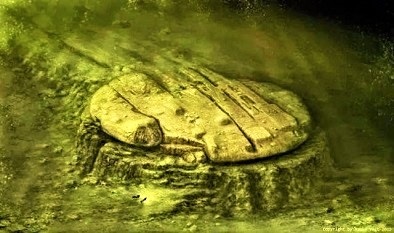 The 200 foot stone structure known as the Baltic sea 'anomaly' above, top, left, is perched on a 26 foot wide petrified platform. 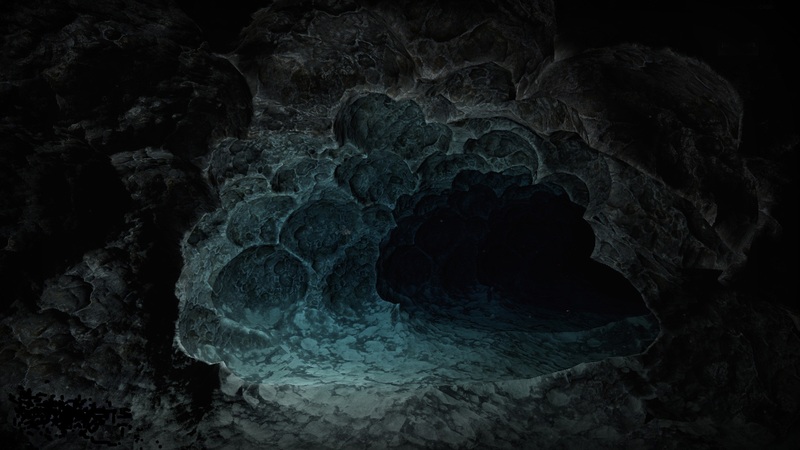 Scientists studying pieces of the underwater stone structure found they were made of a mixed metal alloy of limonite and geothite, a blend of metals that are not found naturally in nature, but have been smelted and forged together in a smelter or foundery. The divers also discovered that inside the object is an unknown, active mechanism that radiates a force field that stops the workings of all electrical objects that come within 200 feet of it. When moving out of this 200 foot range the electrical objects begin working again. 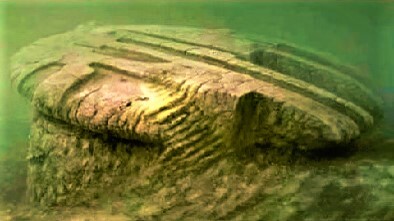 Above are four 'sectional' images of the one Baltic sea object, which actually appears to be three completely separate and distinct objects. The last one on bottom right, looks like flattened mud. Seems there's a lot more going on here than meets the eye. The scuba divers, looking like small ants swimming over the top of the petrified 'steps' near its front right side above, are tiny in comparison to the enormous dimensions. 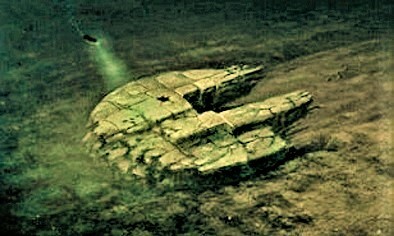 Was this ancient machine or craft a space vehicle, or a scientific structure moved onto its' petrified platform before the area became the Baltic sea, during, or after? There is a large pyramid recently discovered buried in mud on the Ukraine side of the Baltic also. Below are archaic stone - so-called marble and geo-polymer bowl-like objects missing their finer, probably movable metal or ceramic parts. 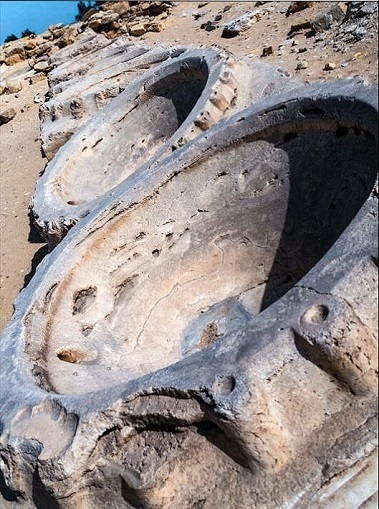 One can see where they were once joined to other parts and pieces and are now lined-up at the ancient Ahu gurab solar temple in Egypt. Petrified metal, and "clay-dough" objects which were once liquid or clay-like and poured into molds or in a form. These marble bowls were allegedly cut in a quarry. But marble too, is made by melting sand and pouring it into large molds to make ceramic objects, just as glass and large pottery objects are made from melted sand or molded from clay, etc. Natural marble, as found on mountains is only formed in warm, shallow seas. Seismic events push-up mountain chains, lifting the marble beds to the hightest sides of mountains. Many archaic, petrified metal, cement, and wooden objects lie around in plain site as hardened parts of once softened "clay-dough-like" stone objects or imprints protruding from petrified "clay-dough" blobs. Some folks state these areas were once stone quarries; but closer analysis actually shows them to be the petrified ruins of technology, and structural and architectural remains from an ancient time, and were not cut from a quarry, nor in a quarry. Archaic megaliths - petrified metal, cement and even wood. 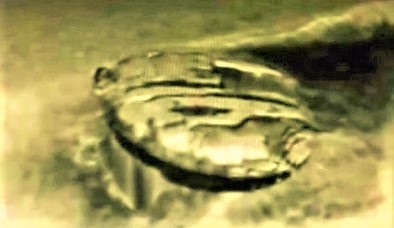 A Space-age style metal building after the Baltic sea anomaly, petrified and corroded by once under-sea conditions shown in above video. A smaller, with similar style structure is also found in ancient Etruscan/Basque lands in Italy. See Etruscan/Basque Structure. The above archaic, and large Khufu-like, but iron pyramid sits in China on the edge of the Gobi Desert on a mud-rock or 'cement' foundation. And excepting the fact that iron this archaic should have rusted into dust and fallen apart after so many thousands of years, one wonders exactly who built it, and why? The enormous Gobi Desert had been an often frozen inland sea from post ice-age melts until many hundreds of years ago, as it gradually sank down and obsorbed into the earth without continuous rain and refilling from more melts. And, although looking like grossly rusted 'cement', the pyramid's sides of iron may have been naturally alloyed with quartz or other silica-type mineral from its ores. But whether it has been semi-petrified by nature's eons, it still stands as a monument of metallurgy and structure building from man's very ancient past.